Sinha popularly known as 'Bihari Babu' had trounced famous Bhojpuri actor Kunal, fielded by Congress from the seat, in the last Parliamentary election. 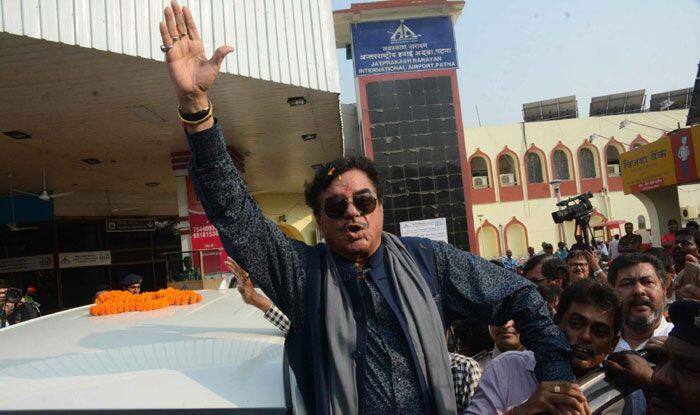 Actor-turned-politician Shatrughan Sinha arrived in Patna on Friday on his first tour of his Lok Sabha constituency after quitting the BJP and joining the Congress and expressed confidence that he will retain the seat for a third time with a record margin. Sinha popularly known as “Bihari Babu” had trounced famous Bhojpuri actor Kunal, fielded by Congress from the seat, in the last Parliamentary election. Before that in 2009, being a BJP candidate he had defeated fellow Bollywood colleague Sekhar Suman, fighting on Congress ticket. “I have come here to fulfil the promise I had been making all through that the location will be the same even though the situation may be different. I am back to the same location. You all know under what circumstances I had to leave the BJP,” Sinha, who joined the Congress last week, said. “In my past two elections I had not requested my friends in the BJP like Rajnath Singh, Sushma Swaraj and Yashwant Sinha to campaign for me, because everybody here knows me,” Sinha, who had been associated with the BJP since the 1990s but turned critical of its leadership in the past few years, said. “You all know how Prasad was given the ticket while I still was in the BJP. Nobody even showed the courtesy to have a word with me on the matter. I truly believe that the Congress for me would mean a new direction and a better condition (nai disha behtar dasha),” the former Bollywood star, who is known for his one-liners, said.